Some rooms just cry out for a floor that will create impact. 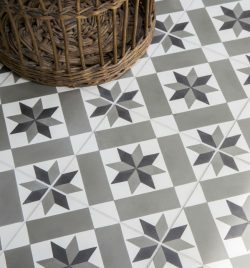 From bold ceramics to stunning encaustic tiles, the most stylish homes have a patterned tiled floor that really packs a punch. 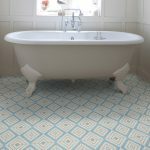 Not only are beautiful encaustic tiled floors a pleasure to behold, but they hard-wearing, practical and easy to clean. 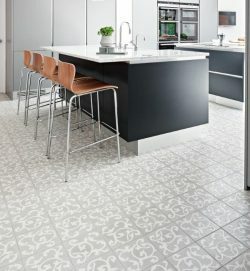 The pattern on encaustic tiles is not created with a coloured glaze, like ceramic tiles, but with different colours of clay, so the design runs through the tile. This makes them perfect for areas that must withstand a lot of foot traffic or muddy shoes such as the hallway or a boot room, as the pattern will never wear away. A creative way to smarten up an uninspiring entrance is to include patterned tiles. A simple neutral hallway takes on a whole new personality when it has the Victorian-inspired but modern, graphic design of the Chelsea Pattern Tile to give it impact. In a small room such as the bathroom, a patterned tile adds style without overwhelming the space. A traditional tile pattern paired with more contemporary elements such as a roll top bath, Victorian style sanitary ware and panelled walls, can create an irresistible combination. Our Darcy Pattern Tile, for example, offers a retro pattern that adds interest to the bathroom but is easy on the eye thanks to the soft and subtle colours. 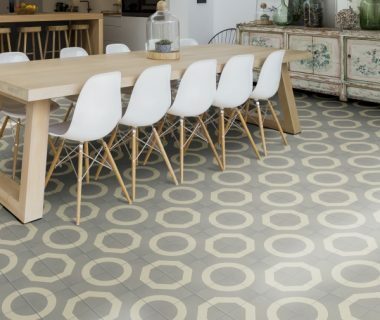 Whether you think big and choose large tiles featuring a big, bold pattern or you go for a smaller repeat pattern – encaustic tiles will create an impactful floor to be proud of. If you’re looking for a tile that packs a punch then consider the Lily Pad Pattern Tile. This hexagonal shaped tile will fit together to create three different designs, and although the pattern is bold, the simple colours in the tile (available in three colours) prevent the overall look from being too overwhelming and perfectly suits a contemporary home. For a more subtle look, the Bloomsbury Pattern Tile might be one to consider. Its delicate design and pale colouring add charm and modern interest to a period home. For a tile that offers a unique design and instant interest to any kitchen, the Illusion Pattern Tile will be hard to beat. This quirky tile is available in several colours and can create three different modern designs. 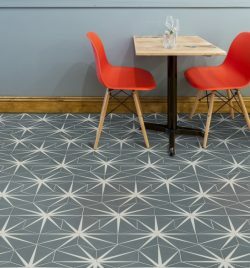 As the design is so bold, it is definitely not for the faint-hearted, but it will certainly create the most amazing impactful floor. Pattern will energise a room, and inject it with some of that all-important wow factor that every room needs if it is to be a pleasurable place to hang out. The best thing about a patterned tiled floor is that a simple neutral palette is all that’s needed elsewhere because the impactful patterned floor will take all the limelight. This one quality element in an otherwise inexpensively decorated room is all that is needed to turn it from dull to utterly delectable.